Invisibledoors® has further developed its range to now include a Frameless Cupboard, a perfect solution for riser cupboards, services cupboards, and standard cupboard doors. Supplied with adjustable concealed hinges. The hinges give you adjustment on 3 axes combing the ultimate finish with ease of installation and versatility. The Invisibledoors® Cupboard is a solution to a longstanding problem of concealing doors while ensuring they remain durable and easy to fit. It’s an innovative cupboard system that allows doors to be fitted flush with the wall. Fitting the Invisibledoors® Cupboard is much easier than using a shadow-gap system or building bespoke joinery with lift-off-panels – and also delivers far superior results. This system INCLUDES a 44mm lipped and primed door, concealed hinges, the frame system, and strike plate. For alternate door finishes and 54mm doors - £POA. See FURTHER DETAILS below for ordering option details. Please enter valid dimensions, click the 'update sizes' button and then enter your wall thickness to view cost. Wall Thickness - Please measure the total thickness of the studs and the drywall on the finished wall. Strike Plate / Lock Options - Please select which latch / lock plate you require. Deadbolt - Used with normal key for security. Roller Latch - Used to latch the door in place, normally used with a pull handle. Fire Door Options - Please select if you would like a normal door or a FD30 fire door. Handing - Please select the type of handing you require. Left or Right. For further information please see the handing diagram below. 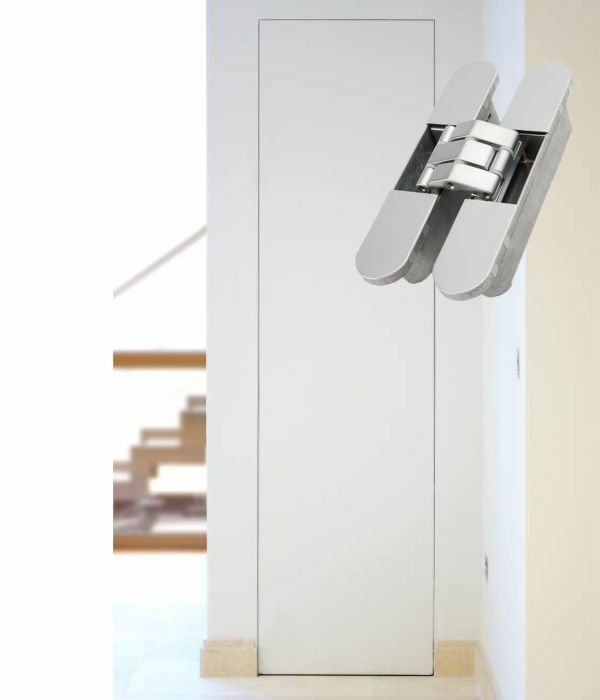 To hand a Invisibledoors® door, it is best to imagine you're stood in the doorway with your back to the hinge / pivot looking straight ahead, whichever way the door swings when opening the door is the hand i.e. the door swings to the left away from your body, the door is left handed. Ezy jamb is a flush door frame system that is used to create and enhance minimalist interiors and for concealing doors, riser doors and service cupboards. The Ezy Jamb range includes, the outward opening Arriva system, inward opening Innova system and frameless cupboard system.